A group of family, friends and others moved by the life and sacrifice of murdered United Nations armed group expert and peacebuilder Michael J. Sharp ’05 plan to summit Kilimanjaro in Tanzania on the second anniversary of his death. The popular hike was “on MJ’s bucket list,” said his father, John Sharp, who during the 8-day journey will carry ashes to scatter on Uhuru Peak, 19,341 feet above sea level. 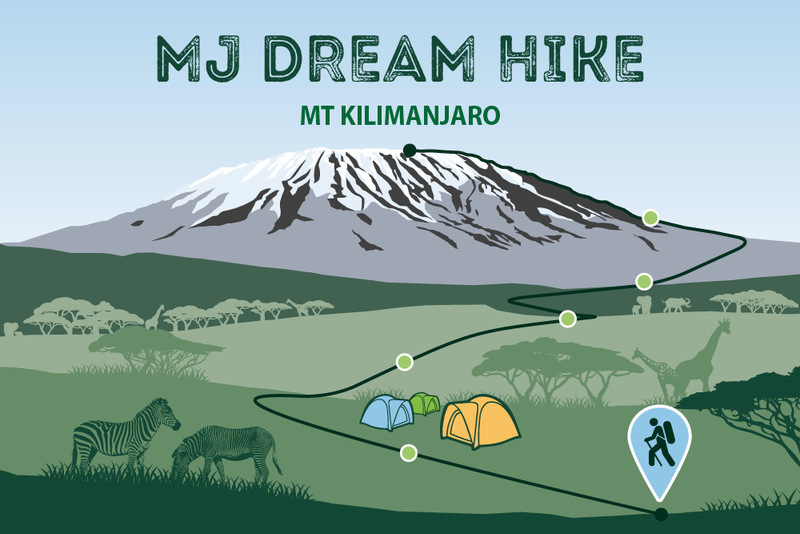 Visit the MJ Dream Hike website to learn more, donate, or join the trek! The March 4-15 expedition will raise funds for the Michael J. Sharp Endowed Peace and Justice Scholarship at Eastern Mennonite University, his alma mater. Trekkers each hope to raise $10,000 for the scholarship. The scholarship, started by friends and family shortly after Sharp’s death, is currently supporting its first recipient. David M. Nyiringabo, a peacebuilder in the Democratic Republic of the Congo (DRC), began studies this fall in the two-year MA in Conflict Transformation program at EMU’s Center for Justice and Peacebuilding (CJP). The scholarship is specially designated to support Congolese peacebuilders. A United Nations armed group expert, Sharp was on his way to meet with leaders of a militia group in central DRC when he was ambushed in March 2017. He and a colleague Zaida Catalán were seeking to better understand the militia’s structure, support networks, recruitment and use of child soldiers, and use of magic. The two were murdered by unknown assailants, and the investigation into their deaths continues today. Their three Congolese drivers – Isaac Kabuayi and two unnamed others – are missing, as is Congolese interpreter Betu Tshintela, who has been implicated in the murders. Prior to this work, Sharp, a 2005 graduate of EMU, was with a repatriation program in the DRC that returned more than 1,600 combatants and 23,000 civilians to Rwanda. The program also helped facilitate four public disarmaments of Democratic Forces for the Liberation of Rwanda fighters. With the participation of a dozen or more trekkers – several spots are still open – Sharp and trek co-leader Wilmer Otto ’73 hope the event will raise more than $200,000. Otto, a businessman and global entrepreneur based in Arcola, Illinois, says his friendship with John Sharp goes back to their days at Rosedale Bible College. Sharp, a retired history professor at Hesston College and his wife, Michele Miller Sharp, reside in Hesston, Kansas. The men were together in Illinois where Sharp was conducting historical research when the news came of the disappearance. Otto continued to support the family as the tragedy unfolded and through the ongoing investigations into the murders by the United Nations, the Swedish police, the FBI and investigative reporters. The goal of climbing the mountain in honor of MJ emerged in late 2017 as Otto traveled back and forth on business trips to Tanzania, where he is involved in financing agribusiness aid efforts. Childhood friend and scholarship fund instigator Keith Grubaugh, of Vancouver, British Columbia, Canada, is an enthusiastic supporter of the trek. While visiting EMU during the October 2017 Homecoming and Family Weekend to be with Sharp’s parents as they accepted the EMU Life Service Award on their son’s behalf, Grubaugh met students and faculty at CJP. Among the trekkers are others who never met Sharp but are inspired by his life and legacy such as Fred Kniss ’79, EMU’s provost. Kniss has a personal connection to East Africa, having spent five years in Kenya coordinating Mennonite Central Committee and Eastern Mennonite Missions volunteers. But it was the similarities between Sharp and his own son, also named Michael, that touched his heart. The two Michaels were one year apart in age and both classmates and history majors at EMU. Interested in joining the trek? Click here.